Apple has a new big pharma partner to help put its new Apple Watch with built-in electrocardiogram (ECG) through its paces, signing an alliance with Johnson & Johnson. 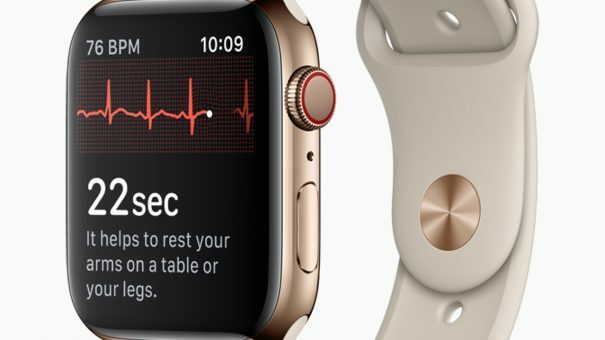 The collaboration centres on seeing if the Apple Watch’s heart rate monitoring ECG functions can be used for earlier detection of atrial fibrillation (AFib), a heart condition that causes an irregular and often abnormally fast heart rate. While AFib typically causes warning symptoms such as dizziness and shortness of breath in around a third of cases it can go undiagnosed, putting people at risk of life-threatening complications such as a stroke. Having AFib gives a four- to fivefold increased risk of stroke, and it kills around 130,000 people in the US every year. J&J and Apple want to see if the Apple Watch can be used alongside an app developed by the pharma company to “accelerate the diagnosis and improve health outcomes of the 33 million people worldwide” living with AFib. A multi-year research programme will be launched later this year in the US and will focus on individuals aged 65 or older. As well as looking at the device and the app’s impact on diagnosis, it will also assess adherence with medication for AFib. Apple currently has FDA clearance for monitoring with its latest Apple Watch, so long as it isn’t used to replace traditional methods of diagnosis or treatment, but the link-up with J&J could give it a clinical pathway to seek an approved health claim in AFib, including stroke prevention. “Too many people living with AFib are unaware of their risk, and ECG earlier detection, diagnosis and treatment of AFib could significantly improve outcomes,” said Paul Stoffels, J&J’s chief scientific officer. It’s no secret that companies like Apple and Google have big plans in healthcare, and the tie-up with J&J is just the latest move in this direction by Apple, which is constantly filing patents and investing in health-related R&D. It has been actively developing its devices for a diverse range of healthcare applications, including patient monitoring, handling health records, data collection in clinical trials and real-world studies, and providing after-care to hospital patients. The company’s CEO, Tim Cook, has said that the healthcare market makes the smartphone market look small. With sales of the iPhone starting to decline, healthcare is giving Apple a chance to increase sales of its devices into new demographics, thanks in part to the ease of using its various devices alongside each other, according to analysts at CB Insights. Apple now has a couple of competitors in the market for its EC-enabled Watch, including Nokia unit Withings which unveiled its MOVE ECG sensor at this year’s Consumer Electronics Show in Las Vegas, and AliveCor, which has an ECG system based on a wearable band that transmits data to a smartphone. Meanwhile, for J&J the alliance gives it an opportunity to build on its previous work with the mSTOPs (mHealth Screening to Prevent Strokes) study with iRhythm Technologies’ Zio wearable patch, which showed that earlier screening can lead to increased AFib detection.